Zhang Tianliang, a doctorate in electronic engineering and an associate professor at Feitian College in New York, was a participant in the 1999 appeal. Addressing the crowd in Washington by phone, he said there has been a lot of propaganda surrounding the historic event, including the claim that the CCP decided to persecute Falun Gong because the practitioners had “besieged” Zhongnanhai. But in reality, harassment of Falun Gong started as early as 1996, Zhang said. Another qigong group that had around 30 million members also was suppressed, and its members had never “besieged” Zhongnanhai. 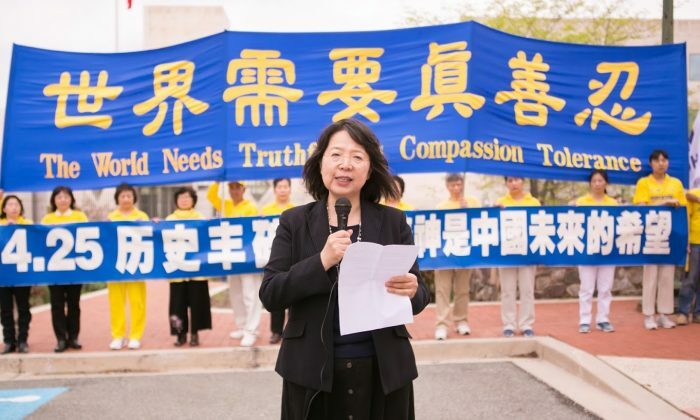 Zhang said the reasons for the persecution were that too many people were practicing Falun Gong, and what they believed was different from what the CCP believes. The ultimate purpose of communism is to destroy humankind. Today, Chinese society has become a place where people are “racing to the bottom” and competing with one another to see who can be more evil, Zhang said. When a society comes to this stage, there is no hope, and this is exactly the result the CCP wants to see.